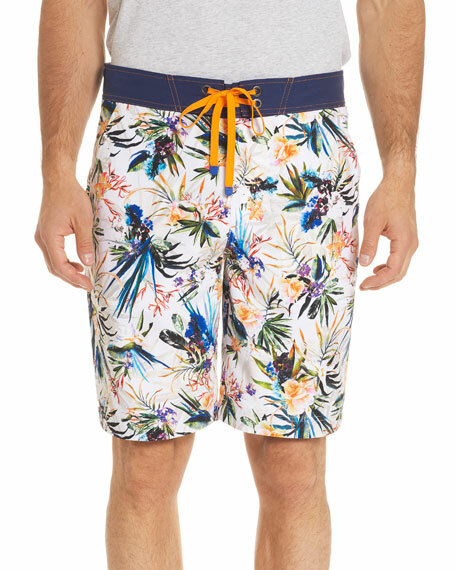 Robert Graham "Rumba" swim trunks in tropical botanical print. Robert Graham "Dos Rios" swim trunks with graphic-print trim. Twill remains solid when dry and turn to an allover floral print once wet. Side slip pockets. Relaxed fit through wide legs. Straight hem. Elasticized, drawstring waist. Polyester. Imported. 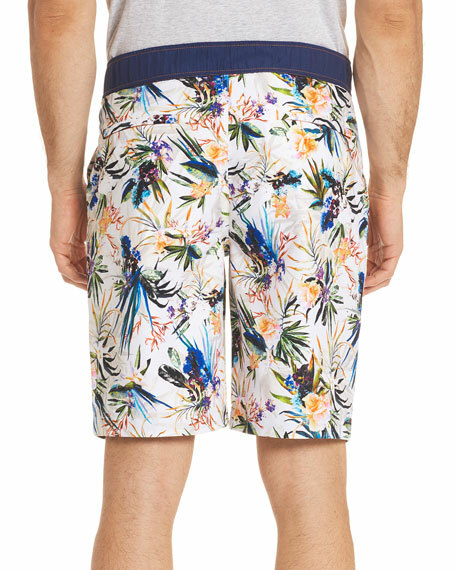 Model's measurements: Height 6'1"/185cm, waist 32"/81cm, typically wears size M.
Vilebrequin "Mahina" swim trunks in print of koi fish pond, fans, and lilies. Approx. 15.6" outseam (size M). Fast-drying stretch fabric. Side slip pockets; back welt pocket. Elasticized drawstring waistband. Rear eyelets for air evacuation. Pull-on style. Nylon. Imported. Vilebrequin swim trunks in mini fish print. Fast-drying stretch fabric. Side slip pockets; back flap pocket. Elasticized drawstring waistband. Rear eyelets for air evacuation. Pull-on style. Polyester. Imported. Model's measurements: Height 6'1"/185cm, waist 32"/81cm, typically wears size M.